I had my first appointment with the high risk doctor today, and just about everything went really well. The baby actually measured three days ahead this time, at 11w1d, and had a heartbeat of 161bpm. 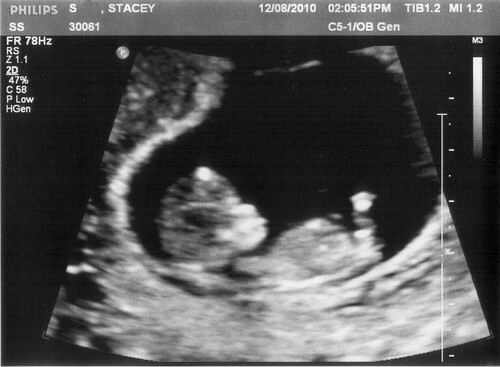 I got to see two little arms and legs, was able to see the heartbeat this time, and our baby moves now! I'm so used to looking at ultrasound pictures that I think I kind of forgot that the babies do actually move around in there too. How neat. And I heard the heartbeat and (sort of) saw the placenta and umbilical cord! So everything looked good with our remaining baby, and it turns out I was wrong with what would happen with the second sac - apparently the sac itself will not eventually be reabsorbed as well, but will just get squished by the other sac so it won't be as visible, and then might be visible as a "plaque" (I think that's the word he used) on the other sac at birth. So I was banking on the other sac being reabsorbed in hopes that would stop the spotting I've been having for nearly two months now, but after poking and prodding me and viewing things from several different angles, the doctor wasn't able to determine the source of the bleeding (no apparent subchorionic hemorrhage), so he also thinks it's because of the second sac. He agreed that it's "concerning" (that's twice in a week now that I've heard that, from two different doctors...ugh), but thought that it would be likely that the spotting would start decreasing soon and that I have a good chance at a healthy pregnancy. I also remembered all the questions I forgot to ask my OB last week (when I felt like an idiot for not having a single question at my first appointment), so while I'm supposed to continue on the Prometrium and Estrace for about another week and a half (12/19), he said I could really just stop now since RE's will typically keep people on medications longer than is really needed once the body starts picking up the slack. So I actually will run out of meds a little before the 19th, so we agreed that I would continue taking them until I ran out, but there was no concern with needing to taper off them or order more to continue through to the 19th. He also recommended I stop riding :( I was only planning on riding for a couple more weeks anyway, but he was concerned with the spotting and thought I should be taking it more easy rather than riding a not-very-smooth horse. So maybe I'll go out in a couple of weeks to love on Rudy one more time (since that would have been the last time I would have gone out to the barn anyway), and then I'll tell his owner that I'll be taking a break and try to pave the way to hopefully be able to call him in a year to see if he has a horse for me to ride then. I also apparently misunderstood the requirement to have a "delivering doctor" in order to be seen by the high risk doctor. I should have just given them the doctor's name who serves as backup to the midwives, but I interpreted it as they would not be willing to work with the midwives at all, which is apparently not true. So the high risk doctor told me I could start seeing the midwives now and he would work with them on the plan for my care going forward, and that they'd be able to do some of the scans, tests, etc., themselves anyway. I was all gung-ho to call them when I got home from my appointment to see if they'd be willing to see me now that I no longer have a twin pregnancy, but then realized that it would probably be better to stick with the original plan of waiting until I was out of first trimester before I switched to them, just in case. Especially since my NT scan is now scheduled with the high risk doctor for 12/20, and I don't want there to be any confusion with where the results should be sent. So I'll have them forward all the results to the OB (which should be done about a week after the scan), I'll go to my next appointment with the OB on 12/28, and then if all is going well by that point, I'll try to switch back over to the midwives.